Green Square development, with the much-anticipated Gunyama public park, sports field and aquatic centre some of the precinct’s coming attractions. Commending Allen Jack+Cottier's approach, an independent judging panel found that it exhibited design excellence and would provide a positive contribution to the existing urban fabric in this important location. Allen Jack+Cottier's design features four buildings ranging up to 10 storeys in height. It will provide more than 220 residential apartments on two parcels of land. 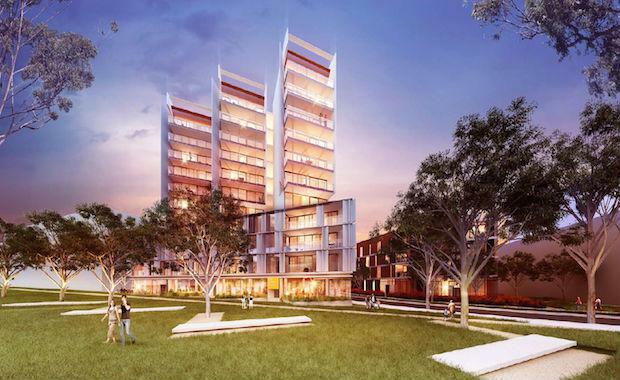 The Epsom Road site will centre around a communal courtyard, while the north-facing Gunyama Park apartments will be less conventional, with an ‘iconic’ modular form arising from the site’s triangular shape. “We applaud what the City of Sydney is doing to lead the transformation of the Green Square area into a vibrant, design-focussed and interesting part of our city, and are delighted to be working alongside Meriton to play our part in that process,” said Michael Heenan, CEO and Principal, of Allen Jack+Cottier.